How could you not love the scrapbooking isle at any ‘craft’ store? I never seem to leave without a couple of sheets to add to my ever growing collection! And since I am not a traditional Scrapbooker, this is how I justify it~I line the inside of all the bentwood boxes I paint on! First be sure to have enough scrapbooking paper to cover the size of the box you have painted…..I do not have any real trick to this or a rule of thumb ~ always grab 3 to 5 pieces when shopping…..this should cover it. To begin ~ always add a little ‘security’ for the handmade bentwood and cuts…..Paint all the seams of the bentwood with matching paint to the scrapbooking paper or the painting itself ~ this will leave a nicer finish in the end if a paper doesn’t fit exactly right. Then begin by turning the scrapbooking paper right side down and with a pencil draw around the base and the lid, then cut with scissors….you may need to cut on the inside of the circle you traced or smaller to fit inside the bentwood….I keep cutting round and round until it fits. Then measure the sides and cut all pieces (yes there will be some overlapping)…..don’t forget the lid too! 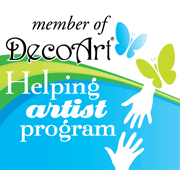 Bring out the best ever made sticking power ….Decoupage matte by DecoArt! First adhere the bottom and lid round pieces…..be sure to extend the decoupage to all areas…good coverage. Then adhere the sides, be sure the decoupage is all the way to the top of the box, start at seam as shown and press hard! You will need to overlap to accommodate the box size ~ next piece, begin at the indent for the seam as shown, then secure and overlap the paper on top of the last piece. When completely dry, trim off any access above the lid and top of bottom of bentwood. As shown in this example I chose to add a chalkboard to the inside of the lid. I also have completed the entire inside of boxes with scrapbooking paper. The ideas are endless! The final step…will complete and make your piece look finished….Do you see that white edge of the paper sticking out like a ‘sore thumb’?…. basecoat it with the ‘box’ paint. The little things….make a big difference ~ between a $5.00 craft show find and an heirloom piece! And here are a few finished pieces (some are ‘working’ images) ~ lined with scrapbooking paper. If it is worth creating ~ it is worth finishing the inside as well….whether it be an extension of the painting, an unexpected surprise, a message, or lining with paper…..go all the way and make it an heirloom piece! ‘Halloween Pumpkin on a Vintage Scale‘ will be released in September. This is part of the Vintage Scale Series, done in Colored Pencil on Bentwood Boxes…..you will find additional pieces to the series on the pattern page. There will be a bonus pattern to the ‘Halloween Pumpkin on a Vintage Scale‘ ~ keep watching FaceBook for photos! Are we friends? Enjoy….start digging thru that scrapbook paper pile! 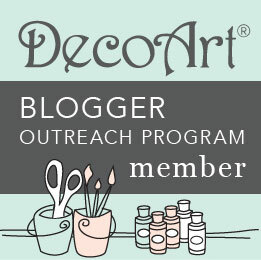 Love reading your blogs, always something new to learn, thank you for always sharing!! Thank you so much I just love sharing creativity and connecting with creative folks! Good idea, I used to sew a lot so I used fabric. Fabric sounds like fun too! Of course we are friends….creative minds always think “alike”. I love the lined bentwood boxes and and knew that I was “hooked” on them with the first one I saw of yours. Thank you for sharing your “tricks”. Enjoy sharing together my creative friend! Been lining my boxes (or embellishing them with designs) since taking the wonderful “scarecrow face” class with you! I love your creativity and your willingness to share. You make us all look good😉. Thank you! …..we need to use our paper somehow! Love it and thank u! Thanks for the tips, I like how the paper finishes the box. So many pretty papers to choose from!